The border conflicts between the two former Soviet republics did not cease throughout the history of their independence. The presence of a number of enclaves on both sides, strategic economic facilities in disputed zones - in short, no one was in a hurry to solve them a multitude of problems. Out of the 60 disputed sections of the border, the enclaves Sokh, Barak, Shakhimardan, Andijan reservoir, the section along the Gavasai and the Ungar-Tepa (Ungar-Too, Unkur-Too) more often become the object of conflicts reaching the armed confrontation. The issue of water use is the most common basis of cross-border disputes, which is extremely relevant for Uzbekistan because most of the rivers feeding its farmland have origins in Kyrgyzstan and Tajikistan. These countries, in turn, are trying to regulate the water issue through the construction of new hydropower plants in every possible way. Learning about the death of the first president of Uzbekistan, Islam Karimov, the head of Kyrgyzstan Almazbek Atambayev did not attend the funeral preferring to host the World Games of Nomads in Kyrgyzstan and sending the prime minister in his place. It would seem that it illustrates the meagre degree of relations between the nearest neighbours. 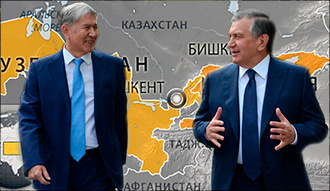 In Uzbekistan, the Kyrgyz leader arrived only in December 2016, held talks with Mirziyoyev, a newly elected president. At the same time, it was decided to start delimitation and demarcation of the shared border of 1,378 kilometres. Many considered that things are moving, and the signing of such a document would lay the foundation for good-neighbourly relations between the two countries, while independent experts doubted such a perspective. For example, the former head of the government commission on border issues, Salamat Alamanov, told Fergana that the border treaty had been prepared for signing in 2006. Specialists criticised him, believing that even after signing the document, both republics would receive no clear boundaries, but a "continuous bolter" with problem areas. "According to my calculations, in the treaty, which is going to be signed today, about 40 of the hottest areas have been left out. If the treaty does not resolve the issue of at least one disputed territory, I see no point in signing it. It is also worrying that the draft document was prepared hastily, and the frequent change of the deputy prime minister of Kyrgyzstan, the key person on the issue of delimitation of the border, suggests that the agreement is not quite professional," Alamanov explains to Fergana. One of the members of the Kyrgyz delegation on the implementation of the intergovernmental agreement on the establishment of common borders confirmed, asking not to disclose his name, that the treaty does not affect 35 disputed areas where conflicts had previously been regularly occurring. "For the reason that the treaty is a secret document, we are forbidden to disclose its details," the source said. Head of Foreign Policy Department of the Office of the President of Kyrgyzstan Aizada Subakozhoeva said that more than 200 kilometres of the border will remain beyond the treaty. Kyrgyz members of parliament reviewed this document on 4 September, as a matter of urgency. Fergana turned for comments, but they could not clarify the situation. So, the member of parliament from the Ata Meken Party Almambet Shikmamatov said that the meeting did not last long, and he did not even have time to get acquainted with the details of the agreement. "The content of the contract is confidential information. We were given out folders and taken away in ten minutes. It is impossible to consider international documents for such a time," Shikmamatov explained. Obviously, signing a treaty is in a hurry, but it's just not clear why such a rush? On the other hand, the warming of relations between the two republics should, in any case, be regarded positively. Associate researcher at the School of Oriental and African Studies of the University of London, Alisher Ilkhamov, considers the beginning of Uzbekistan's close cooperation with its closest neighbours the main achievement of the new Uzbek president at the moment. According to him, the delimitation of most of the border with Kyrgyzstan was carried out in just one year, which would have been impossible without political will. But a real breakthrough in the development of bilateral relations can only lead to joint economic projects when the goods of the two countries move freely across the border. "However, success in mutual trade will depend on how quickly and efficiently Tashkent will abandon mercantilist, protectionist foreign trade policies with its characteristic high tariff barriers and the complex procedure for customs clearance and obtaining export licenses," Ilkhamov said. Other observers advise not to rush to conclusions. Unlike the Tajik-Uzbek relations, which, indeed, have come out of the impasse, there is no such progress with Kyrgyzstan, says conflict expert, associate professor at the Diplomatic Academy of the Ministry of Foreign Affairs of Kyrgyzstan Japar Birimkulov. He emphasises that, most likely, only those parts of the border not arising questions will be delimited. And the real goal of Mirziyoyev's visit is not to resolve border conflicts, but to build a railway from Uzbekistan to China through the southern regions of Kyrgyzstan - so much more profitable for Tashkent. While in Bishkek it is believed that the route needs to pass across the north of the republic, where its main economic potential is. It is impossible not to mention the water and energy aspect. Mirziyoyev, according to Birimkulov, is leading a more flexible policy in this direction than his predecessor, but it guarantees no amicable solution to this issue. At least, Kyrgyzstan intends to continue the construction of the Upper Naryn cascade of the Kambarata hydroelectric power stations, which can only exacerbate the problems with the lack of water for the neighbours. "In resolving these issues, one should follow the principle 'if you can not feud - strangle with embraces." If Kyrgyz authorities will be able to interest Uzbekistan in the construction of the hydropower plant, both countries will have similar interests in the future," Birimkulov predicts. Political scientist Alisher Ilkhamov also weakly believes in resolving the whole range of issues on the agenda. It will be more difficult for Uzbekistan to make compromises and to link the water issue with the energy issue, he believes. According to Ilkhamov, Uzbekistan will most likely focus on increasing trade between the two countries. In support of his words, the expert cites the fact that Tashkent is moving to free currency conversion, which, in turn, can lead to shifts in the direction of establishing market mechanisms and in foreign trade. But this is not the prospect of the near future. "I think it is a more complicated issue than the border. Here it will be more challenging to reach a compromise. For this, Uzbekistan must agree to link the water issue with the energy issue. It requires a significant internal restructuring. I do not think Tashkent is ready for this now," the expert said.